The OECD's latest edition of its "Education at a Glance" report provides an insight into education systems on all of the organization's member states. One interesting aspect of the research is the amount of time teachers actually spend in the classroom. 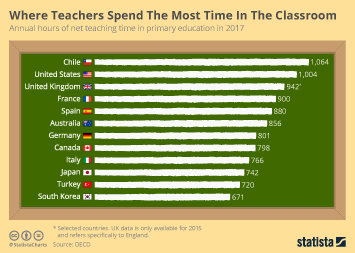 On average, primary school teachers in OECD countries have to teach 784 hours per year in public institutions, though there are big differences in teaching time between countries. Generally, teachers spend between three and six hours each day in the classroom, though there is no set rule on how teaching time is distributed throughout the year. Take Spain as an example. 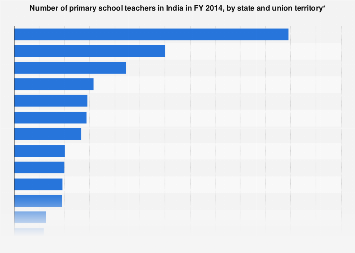 Spanish primary school teachers have to teach for 880 hours per year which is 100 hours more than the OECD average. However, by the end of the year, they work fewer hours than other countries because they don't have as many days of instruction. The following infographic provides an overview of the annual net hours workers in primary education across 12 selected countries. 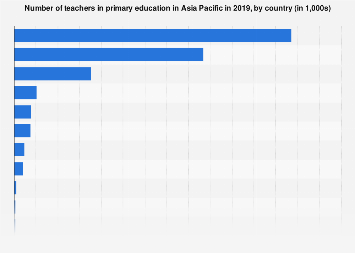 In Chile, a primary school teacher works 1,064 hours per year on average with the U.S. close behind with 1,004 hours. Asia's advanced economies are further down the list with Japan and South Korea having 742 and 671 hours of primary instruction time respectively. This chart shows the annual hours of net teaching time in primary education in 2017.